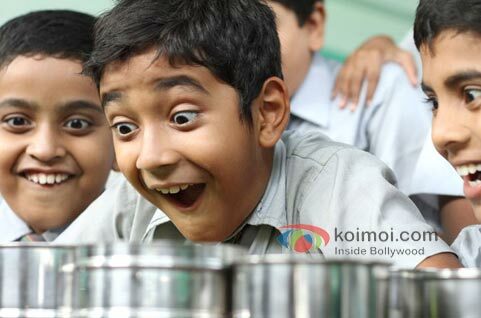 Stanley (Partho) eats food from his classmates’ tiffins but stops going to school when he is scolded by his Hindi teacher (Amole Gupte) for the same. What happens next? Find out in the review of Stanley Ka Dabba. What’s Good: The performances; some portions of the humour; the strong message in the end. What’s Bad: The lack of dramatics and emotions in the first half. Verdict: Stanley Ka Dabba is a well-made film but has limited commercial prospects unless supported by schools. Watch or Not? : Watch it for its making and the good intentions. Fox Star Studios and Amole Gupte Cinema Pvt. Ltd.’s Stanley Ka Dabba is a story of Stanley (Partho) who goes to school and invariably eats food from the tiffins of his friends. Stanley’s Hindi teacher, Babubhai Verma (Amole Gupte), is shameless enough to eat from the tiffin boxes of his students and doesn’t even mind stealing from the tiffins of the other teachers when they aren’t around in the staff room. Verma teacher soon realises that Stanley could be the reason for his students not wanting to share their lunch with him (Verma) because they have to also feed Stanley. In a fit of rage compounded by frustration at having to go hungry, Verma teacher scolds Stanley and asks him not to come to school if he can’t carry his tiffin box with him. The sensitive Stanley stays away from school thereafter, much to the concern of his friends. What happens thereafter? Why does Stanley not carry his tiffin box? Can’t his parents afford to give him lunch? Or is there some other reason? Does Stanley do anything to give it back to Verma teacher to avenge his humiliation? The latter part of the film provides the answers. Amole Gupte’s story has children as the main protagonists and the film seems to be targetted at the kids mainly. However, the message it gives at the end is for adults and actually brings tears to the audience’s eyes. The film moves at a leisurely pace and appears to be a light-hearted take on the tiffin box and the ever-hungry teacher in Stanley’s school. But the drama takes an emotional turn when the truth about Stanley and his tiffin box is revealed towards the end. The screenplay of the first half doesn’t convey much and gets repetitive after a point of time but that could be because the film has children as the target audience. The drama becomes more interesting post-interval. While the film has a good message to convey, its commercial chances appear to be bleak because there isn’t much scope for children’s films in India. Had Gupte concentrated on making Stanley a darling of the audience with his jokes, anecdotes and lively character, the impact would’ve been far greater. But the way the film has been written, there is just no room for dramatics before the film draws towards the end. This is the biggest drawback of the screenplay, commercially speaking. Partho does well in the role of Stanley. Numaan is cute as Aman. Abhishek does a confident job. Amole Gupte is effective as Verma teacher. Divya Dutta leaves a mark as Miss Rosy. Divya Jagdale is superb as the Science teacher, Mrs. Iyer. Raj Zutshi makes his presence felt in the role of the History teacher. Rahul Singh is alright as the school principal. Aditya Lakhia (as peon Parshu), Shiv Subramaniyam (as the Mathematics teacher), Kadambari Shantshree (as the Art teacher), Shashank Shende (as Stanley’s uncle) and child actors Sai Saran, Monty, Walter, Leo, Ganesh and Tijo provide the desired support. Amole Gupte’s direction is true to the subject. Having said that, it must be added that a film like this would appeal more to the festival audience. Hitesh Sonik’s music and Amole Gupte’s lyrics are okay and ought to have been far more appealing. Cinematography, by Amol Gole, is good.Deepa Bhatia does a fine job of the editing. hai komal pray to god that u were not a victim of child labour , and the sense of movie review is pathetic keep it with yourself !!! You are the one mice which follows the pipper!! I agree with swapnil and think you ought not to write reviews anymore. The movie was excellent with very natural and convincing performances. It was appealing precisely because it doesnt have any of the typical bollywood movies’ dramatics and pretentious frills. Here is a no-nonsense film which slams home the exact message it was intended to give from start to finish. Well done Amole Gupte!!! !